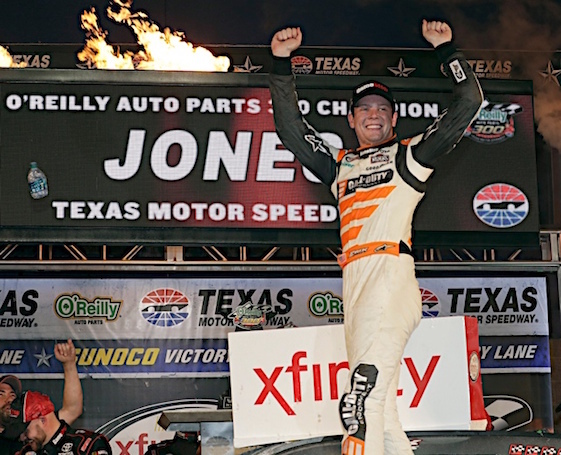 FORT WORTH, Texas – Pole-sitter Erik Jones completed a game/set/match scenario in Saturday night’s 13th annual O’Reilly Auto Parts 300 at Texas Motor Speedway, winning both stages en route to victory in the NASCAR Xfinity Series Playoff race. Jones, who won the My Bariatric Solutions 300 here on April 8 after qualifying second, completed the 2017 Xfinity Series sweep on TMS’ high-banked/1.5-mile oval _ the first since Kyle Busch in 2009. Jones, who qualified on-pole and won his first Xfinity start here in the spring 2015 race, now has won three of his six starts at “The Great American Speedway” in Fort Worth. “It’s sure been a good racetrack to me, on the old track and the re-pave now,” said Jones, driver of the No. 20 GameStop/Call of Duty WWII Toyota Camry fielded by Joe Gibbs Racing. “It’s just been a place I’ve enjoyed coming to. The first time I came here in a truck, I’ll never forget, I never thought I’d like the place and ever since then it’s just kind of clicked for me. Jones finished 1.018-seconds ahead of Ryan Blaney, with Kyle Larson third. That trio of Monster Energy NASCAR Cup Series drivers is ineligible for the Xfinity Series Round of 8 Playoffs, with fourth-place finisher Elliott Sadler emerging as the big winner in that respect. Sadler moved to the top of the scoring table and will take a five-point lead (3,103-3,098) over William Byron into next weekend’s event at the 1-mile Phoenix Raceway. Byron, driver of the No. 9 Liberty University Chevrolet Camaro, started and finished ninth. Jones _ who has scored six top-10 finishes in as many series starts at TMS _ led a race-high five times for 142 laps. Blaney was a distant second with 34 laps-led. “I thought our car was good from the beginning,” said Blaney, driver of the No. 22 Discount Tire Ford Mustang. “I was pretty loose to start but once we got it tightened-up I thought we were really good. I thought the track took another swing free with maybe 60 to go and got our car looser again. But we were still able to run down the No. 20 and get to him; we just couldn’t pass him. Couldn’t pass anybody. Lapped cars were all over the place. It just stinks we couldn’t get around him. “I thought we had a shot after the green-flag stop (on Lap 185). I thought we were way better but we got held up a couple times by traffic. I thought we had the car to win, just a matter of trying to get in front of him and I couldn’t pass anybody. “I tried to get him loose a couple times and couldn’t do it. I about wrecked myself trying to get him loose. It’s really hard to get around anybody. Hopefully that gets a little better for tomorrow.” Blaney was referring to Sunday’s AAA Texas 500 Cup race. This race was the first at night for the Xfinity Series since TMS was repaved and re-profiled during the offseason. The banking in Turns 1 and 2 was reduced from 24 to 20 degrees, and that area was widened from 58-feet to 78-feet in a bid to create more passing opportunities. Turns 3 and 4 remain banked at 24 degrees. Series regular Justin Allgaier, who began the race as Playoff point-leader, finished 11th and dropped to third in the standings with 3,094 points. Allgaier, driver of the No. 7 Degree Deodorant Chevy, is nine points behind Sadler and five in back of Byron. Allgaier has a 15-point lead over Brennan Poole, who is 24 points behind Sadler. Poole finished seventh in the No. 48 DC Solar Camaro. Playoff contender Cole Custer overcame a flat tire early in the 200-lap/300-miler to finish fifth, one spot below Matt Tifft in the pecking order to qualify for the Championship 4 at Homestead-Miami Speedway in two weeks. Tifft finished eighth in the No. 19 Surface Sunscreen/Fanatics Toyota. “We just had a flat tire at the start of the race and had to go pit but we kept our heads on straight and tried to do what we could to salvage a good day,” said Custer, driver of the No. 00 Haas Automation Ford Mustang and the race’s highest-finishing rookie. “We all did a really good job doing that, staying within our limits and get a decent finish. I think we did a good job of that and had a fast race car. I can’t really say I’m too upset or too down going into Phoenix or anything. It’s just two weeks in a row that we had some bad luck. Playoff contender Daniel Hemric, who was forced into his backup No. 21 Blue Gate Bank Chevrolet after crashing on Friday, finished 14th and is seventh in points with 3,061 _ 42 behind Sadler and five behind Custer. Ryan Reed, driver of the No. 15 Lilly Diabetes #DriveYourHealth Ford, finished 23rd and is eighth in Playoff points with 3,046, 57 behind Sadler and 15 behind Hemric. A victory at Phoenix would secure a Final Four spot for any of the contenders. Barring that, every point will count next weekend in the Arizona desert.